Moving and rearranging our home has taken top priority in our lives these past two weeks. Now that we are slowly moving from chaos to order, we can see the light at the end of the tunnel. October 23rd we finalized the deal on our new to us home. October 24th was moving day. We arrived at Camping World (CW) just before lunch to sign all the papers. Our home was in the shop getting some last-minute items repaired. We were told we should be able to get started with our move by around 3PM. 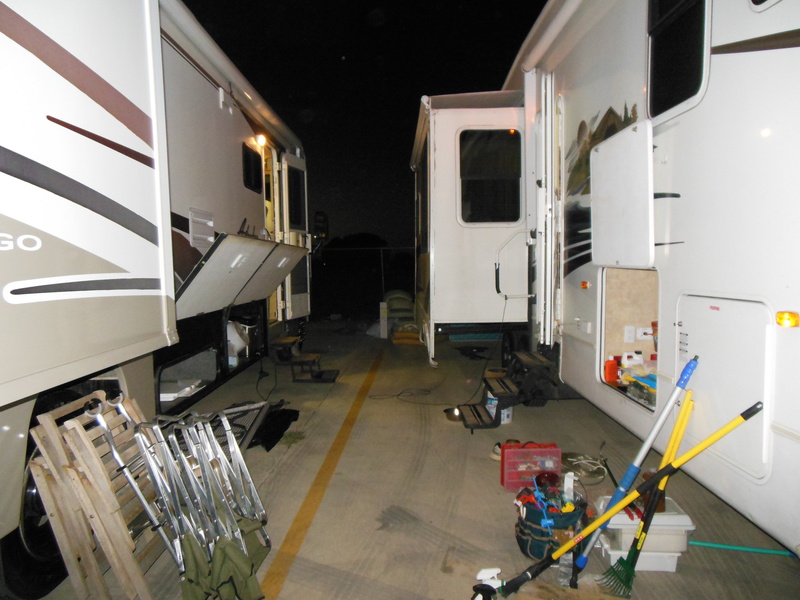 CW moved our 5th wheel to their back lot where we would have water/electricity connections to the 5th wheel. The motor home would run on generator power and had sufficient water to get us through. 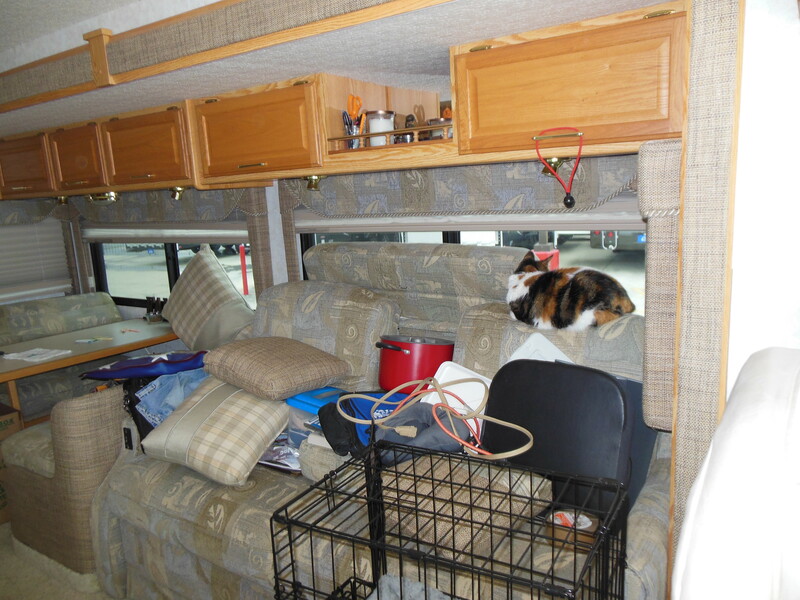 Our plan would be for Carol to be stationed in the motor home and I would moved stuff from 5th wheel. We started in the bedroom. It got dark by 7:30 and we were beginning to show signs of being tired and stressed. How did we ever get this much stuff packed into such a small space. 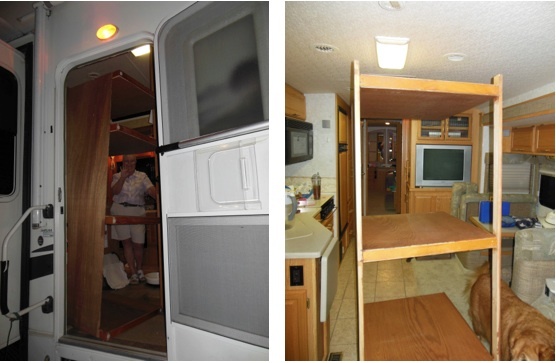 While the motor home has more underbelly storage compartments, the 5th wheel has larger compartments. Once we got the bedroom empty, we decided to move Carol’s craft center. This would go to the rear of the motor home. I think I remember how it came through that door. Once in the motor home, we just carried it to the back. Patches found a new nesting spot. We quit working about 10:30PM and decided that we had more stuff than would fit in the motor home. Our plan was to get some rest so we could finish this in the morning (10/25). 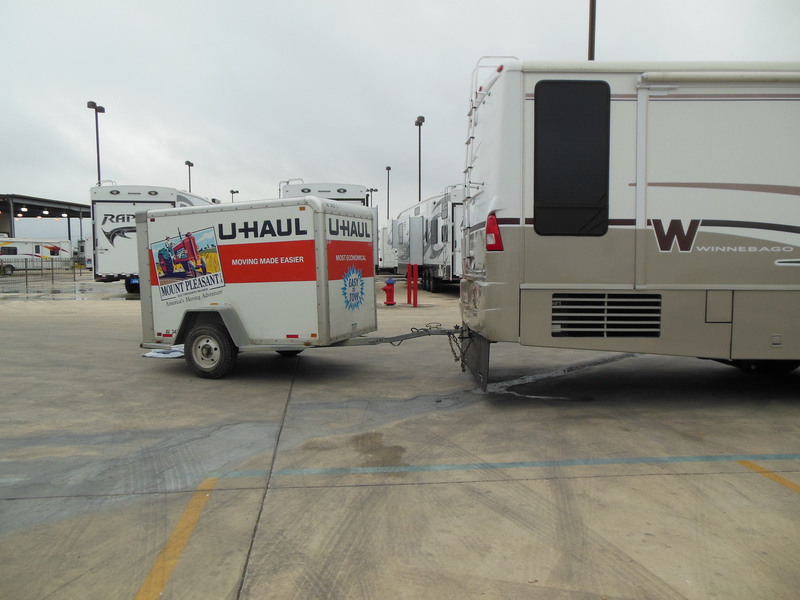 After a week in Corpus Christi, we would be returning to Camping World so they complete what they did not finish. Last stop was to drop off truck and 5th wheel keys to sales staff at CW. We enjoyed the drive to Corpus Christi. 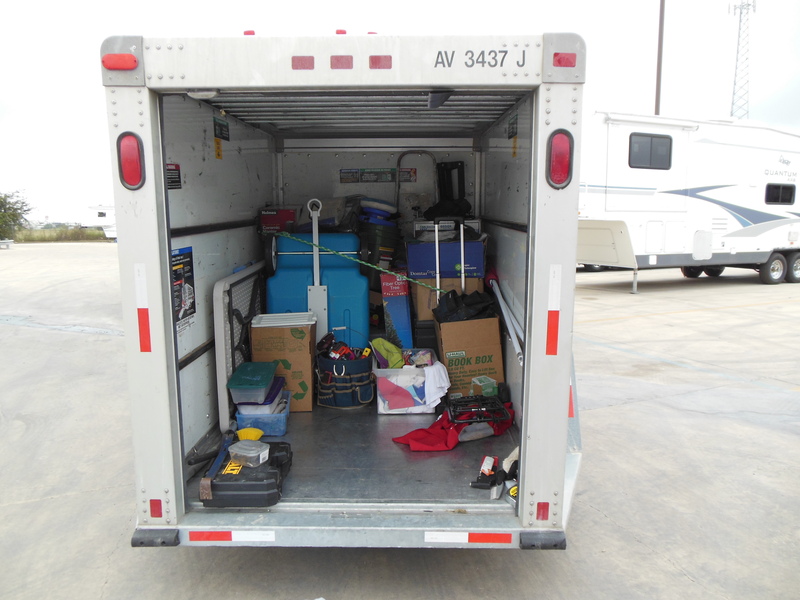 This entry was posted in Texas and tagged backup camera, Camping World, moving day. Bookmark the permalink. I feel for you about moving all your stuff. When we moved into our house from the 5th wheel, I was AMAZED at how muc stuff we had squirrelled away in every little cubbyhole. At least now that we’re back in the land of “stuff”, we have enough room for it. Hope you like your new job, and keep in touch. It’ good to stay connected with the mobile world! I’m looking forward to having such a problem. Our first trip ended in problems before leaving the state. We were headed for Ohio to spend Halloween with our children and grandchildren when I discovered a huge amount of oil on the ground below the diesel engine. I drove it over to our mechanic where it was discovered oil was blowing out the breather tube. Thank God for extended warranty as the engine needs to be replaced. The oil sample found metal and dirt in the oil. The service manager recomended a new engine or re-manufactured one. Now we have only 200 miles on the current engine which had only 35K miles on it to begin with. As the RV was on consingment to Nobel RV we are forced to wait for the insurance to work so slowly through their system. Our prayers our now the work will be done in time so we can spend Christmas with our Grandkids in Oregon. Our plans to spend pre-Christmas in Az are dashed it seems for the time being. I pray your new motorhome does not give you any major problems. It seems buying used can be a gamble. Must feel nice to have new digs. Some times I think about getting a newer fiver (this one is a 2009 model). But then I remember – this one is paid for! Now you can enjoy your new home on wheels.